Johns Creek Pilates Open House on August the 14th! It was a great success, and we are so happy that the Johns Creek Chamber of Commerce was there to support us! For all of our attendees, please remember to redeem your “gift” as soon as you can! Our group classes are filling up fast! I also want to send a special “Thank You” to Erin Baker of Erin Baker Photography and Mark Mandel at Big Head Cartoons for helping make our night very memorable! Johns Creek Pilates will be extending our Open House Special until the end of September! If you are new to Pilates, mention this month’s newsletter and receive three Private sessions for $120* ($210 value). If you refer a friend to this month’s special, you will receive a referral gift of a free group session*. *Both specials will expire on September 30, 2014. If you haven’t got into the habit of making thirst quenching smoothies during the summer then you really are missing out on a quick-to-make cooler that is nutritious and packed with vitamins too. Smoothies and blended fruit juices can be perfect for a pre-exercise boost and a post-workout charge too, as well as inspiring a healthier lifestyle. What’s an affordable piece of equipment that promotes a healthier diet and can really change your life? A blender! To get wonderful smoothies you need to use fresh ingredients, add in some creative ideas and pulse, pulse, pulse! Here’s some summer cooler smoothies to get you started. While there’s loads of innovative smoothies you can come up with, sometimes, the simple, refreshing type are the best, like an orange juice in the morning. Through a few ice cubes into your blender, add orange segments and a zesty squeeze of lemon and lime. If you want a more powerful taste then add in some cold juice instead of the ice cubes. A fine grate of ginger adds a real morning pick-me-up too. You could also try pineapple and Thai basil for a fruity mix with a twist. These smoothies will really get you ready to start your day. To give a workout your all you need a good power surge and what better than the natural energy of a banana smoothie. Chop thick banana slices, add a splash of milk or some natural yogurt to give the smoothie a real creamy texture. Sprinkle in some grated nutmeg which is believed to stimulate the brain and ease tiredness and fatigue, giving you a real spring in your pre-workout step. Bananas are antioxidants and contain potassium, which keep the body’s nutrients at a high enough level before you get stuck into some sweaty exercise. While you always need to make sure you’re drinking enough water, a fruit juice can quench the thirst and give you a vitamin injection too. 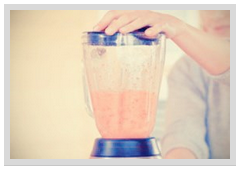 Instead of adding fruit and ice cubes, you can put fresh fruit and fruit juice into the blender. What’s important here is to make sure that the juice does not come from concentrate which is going to give you a sugar rush. Thirst quenching fruit coolers are ideal if you are lactose intolerant too and want to avoid dairy-based smoothies, although you can add in soy, rice or almond milk if you still want the milkshake style of smoothie. After an exhilarating workout, you really need to replenish lost fluids and give your body some nutritional power too. Add a spoonful of peanut butter to a good few tablespoons of natural yoghurt. Next, add in a few cubes of ice and a drizzle of honey. Throw in a few blueberries or grapes and you have your own version of peanut and jelly in a shake. You can also recharge your batteries with this protein hit, with probiotics, calcium and superfruit vitamins. Don’t add in too many ingredients or you might just end up with an off-putting drink that tastes just plain awful. Adding lots of sugar or sugar water defeats the object of making a super healthy smoothie. What’s great about smoothies is that you can experiment and have fun, to find out what appeals to you, much like our training strategies.